The photos below were taken from Tikaboo Peak on June 10, 2007. 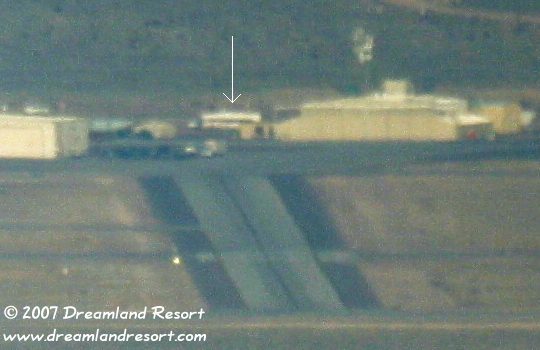 They show new construction at Area 51 since our August 2005 Panorama. The photos go from south to north. The most significant change is # 2: A huge new hangar under construction near the Area 51 South Ramp. All of the new buildings below were discovered by our group on that day, and are shown here for the first time! Please let us know if you have any information to narrow down the timeframe when the various new structures were built. 1) New Building at the Explosives Storage Area: The new reddish building on the right appears to have a row of windows and a large dark door at the north end. The purpose is not known. Built between January 17, 2006 and June 10, 2007. 2) New large hangar near the Area 51 South Ramp: A huge new hangar is under construction south of the Area 51 South Ramp area, near the north end of Rwy 12/30. It is about 1.5 times the size of Hangar 18 (see #5 below), the largest hangar at Area 51 until now. The sides have not been finished, but a large hangar door opening can be seen on the side facing the flight line. A large mound of dirt blocks the view of most of the hangar from Tikaboo. We assume that this is intentional, to hide whatever will eventually occupy the hangar. A possible candidate would be Lockheeds rumored new SR-72, a Mach-6 high-altitude reconnaissance UAV. The estimated size of the new hangar is 200x400ft at 100ft tall. Construction started between January 17, 2006 and June 10, 2007. 3) View screen for the northern extension of Hangar 19 completed: The view screen, which was under construction in our 2005 Panorama, has been completed. The photo shows that there is a screen on the side facing away from Tikaboo as well. So it is not only meant to block the view from Tikaboo, but also from the base itself. Completed between January 17, 2006 and June 10, 2007. A long row of light colored irregular shaped objects can be seen east of Hangars 22-23, between the hangars and the southern taxi way. Unfortunately the resolution is not good enough to make out any detail. It may be equipment, or building material stored along the ramp. 4) New building (?) SW of Hangar 8: This photo shows what may be a small new building in the background, SW of Hangar 8. Compared with the size of the trucks parked on the ramp in the foreground it seems too long for even a large 18-wheeler. It is not present in a January 27, 2006 satellite photo. 5) New building south of Hangar 18: This new building is an extension of the P.E. Building ("Personal Equipment"), where the pilots keep their flight gear, and "suit up" for their missions. Since the South Base area has been expanded quite a bit, it would make sense to need a larger P.E. building as well. Especially with a major new project moving into the new hangar in the near future. Built between January 17, 2006 and June 10, 2007.